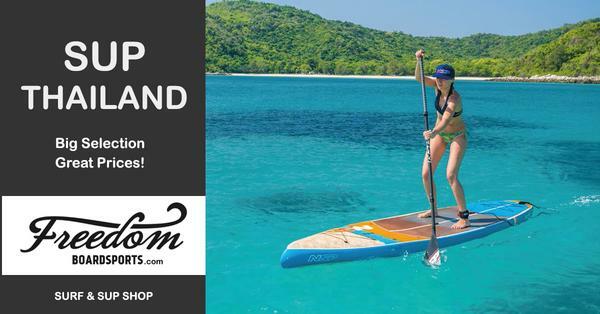 Freedom Boardsports is Thailand and Southeast Asia’s largest surf & boardsports dealer. We have been in the business of surfing, SUP, and watersports equipment since 1986. We provide the local Phuket community as well as Thailand at large with quality surfboards, bodyboards, Stand Up Paddle boards (SUP’s), wakeboards, waterskis, surf rescue boards, and a wide range of related hardware and accessories. We take pride in offering a large top quality selection, competitive pricing, and friendly efficient service whether you are buying a bar of wax or a carbon fibre SUP – a real surf shop run by real surfers and paddlers with over 40 years of in-water experience. SPECIAL OFFER: Get 15% discount off a new Red Paddle Co inflatable paddle board when you pre-order with Freedom Boardsports.